Junior advisors who learn to think like owners have a far greater chance of achieving that goal. Much has been written recently about how owner-advisors should position their firms for succession and how they can train younger advisors to succeed them. Some enlightened firms (including most of our clients) have created programs that “teach” junior advisors to be business owners. Many owner-advisors still don’t have the time or the inclination to train their successors, though, or simply don’t go about it very effectively. That doesn’t mean that junior advisors at these firms (or firms in which the owners show no interest in selling to a successor) should give up on firm ownership or look for another firm. By actively preparing themselves to be firm owners, and demonstrating their increased business acumen, junior advisors can play a key role in their owner-advisors’ thinking about succession and in creating their firm’s succession plan. 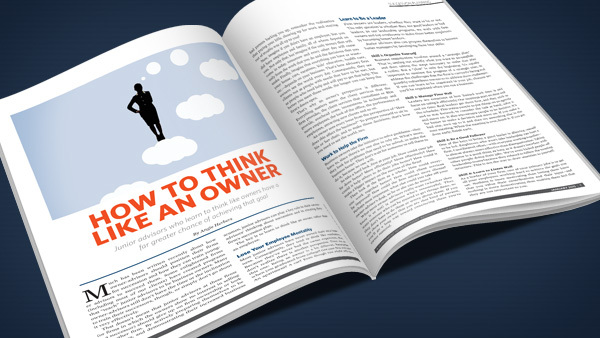 The key is to learn to think like an owner, rather than an employee. Most junior advisors have never owned their own business. Consequently, they tend to think like employees. Because they’ve never had the owner experience, they don’t realize there is another perspective. Trust me on this one: Being an owner is a lot different. Remember when you graduated from college? Got your first real job? An apartment? A car? Even though you might still have had parents backing you up, remember the realization that paying your bills, showing up for work and staying out of trouble was all up to you? Now, imagine if you didn’t have an employer, but you did have employees and family, all of whom depend on you. Not only that, but imagine if the only money that will come in today, tomorrow and every other day will come only from the work that you do and the decisions that you make. Finally, imagine that everything you have or want—your house, cars, vacations, kids’ education, health care, etc.—depends on your business. That’s how advisory firm owners see the world every day. Consequently, they see clients not as people with needs that have to be met, but as people who need help and will pay to get that help. The better you meet those needs, the longer you can keep the firm’s doors open. That’s why an owner’s perspective is different. Everything matters more: the client services that the firm provides, the client services that custodians or BDs provide, overhead costs, investments in technology and more employees, the look of the office, the performance of employees, attracting new clients and so on. An owner sees every issue from the perspective of “How does this affect the business?” To prepare yourself to sit in his or her chair, and to make those decisions, that’s how you need to see the world, too. Business owners take the initiative to solve problems—they have to, since there’s no one else to rely on. What’s more, they look for problems that need to be solved, to make the business better. They don’t wait for someone to tell them to do it, because no one will. So take a hard look, first at your job. How could your job be done better? More efficiently? More effectively? How could it help others to do their jobs better? How could it make a bigger impact on the success of the firm? Then look at the firm as a whole: How could everyone work together better? How could client services be improved? How could the firm attract more clients? Perhaps most important, what else could you take off your owner-advisor’s desk, so he or she can do more? What most owner-advisors really want (whether they know it or not) is someone who’s resourceful. They want someone who can be trusted to get things done, so they don’t have to do them or worry about them. If you can show your owner that you are that kind of person, you’ll go a long way toward convincing them you’re owner material. Firm owners are leaders, whether they want to be or not. The only question is whether they are good leaders or bad leaders. In our leadership programs, we work with firm owners and top employees to make them better employers by becoming better leaders. Business organization revolves around a “strategic plan.” That is, setting out exactly what you want to accomplish and then taking the steps necessary to make that plan a reality. But a “plan” is only the beginning. It’s equally important to monitor the progress of a strategic plan, to address the challenges that the firm is currently facing and possibly redistribute resources to address those challenges. If you can learn to be organized in your job, chances are you’ll be organized when you run a business. Leaders are conscious of how limited work time is and focus on using it efficiently. Our meetings start on time and end on time: Real leaders get there first, and they stick to the schedule. This trains people to put things on an agenda and to stay focused, to consider the task at hand, solve it and move on. It also encourages people to be decisive. It’s far better to make a decision and move on. If you make a bad one, own up to it and then try something else in the next meeting. When the meeting is over, finish it. If you get done early, finish early. One of the keys to being a good leader is allowing oneself to be led. Employees who won’t take leadership can hurt a firm. Coordinated effort—with everyone working together—is almost always more effective than disorganization. Taking initiative is a good thing as long as it doesn’t interfere with other people doing their jobs. We’ve even kicked people off leadership teams because they refused to follow the meeting structure. This is not the way to draw attention to yourself. As a leader of your firm, one of your primary jobs is to get all your employees working hard to achieve the goals you set. Nothing is more motivating than letting them know that you value their contributions and their input—and nothing is more demotivating than making them feel that they are not important to you. While there are many differences between successful advisory firms and successful owner-advisors, we’ve found that most successful advisors usually have the same seven traits in common. While junior advisors aren’t usually in a position to utilize all these traits, they need to be aware of them, study their firm owners (to see what happens when they do or don’t do them) and then put them to use when opportunities arise. Great business owners don’t seek to manage or oversee the people who work for them. Instead, they take average people and make them into great leaders themselves, so they don’t have to be managed. These advisors don’t see themselves as “the boss” cracking the whip every day to get the most out of their employees because they intuitively know that will actually restrict their contributions to the firm. Instead, they see themselves as coaches (or better yet, “playing” coaches), whose job is to train, support and motivate each employee to do their best. Great owner-advisors are fond of saying that they aren’t really all that smart, they just hire smart people. Of course, that’s being really smart because to build a business that’s more that just a job with some support, you have to hire people who can also make substantial contributions to the firm’s success. This allows their employees (and themselves) to know exactly where they are and where they are going as a company. It also makes sure that everyone is on the same page, with the same vision about what kind of firm they are trying to build. The ability to communicate their vision is one of the essential skills of successful owner-advisors: Growth is a lot easier when everyone is pulling in the same direction. Successful advisors don’t care what everyone else in the industry is doing—and they don’t compare themselves to anyone else. Great owners know that their own business plan and benchmarks are the only metrics that matter. Building a successful business is a contest with yourself: putting together a good team, finding what works for you, and then doing it. Every firm is different and what works for one firm may be a disaster for another. Worrying about what other firms are doing or how you measure up is just wasted time and energy. Many advisors have a hard time making the really big, hard decisions such as hiring the next employee, firing a bad partner, acquiring the next firm, building a better service model, firing a horrible client and so on. Great owner-advisors make the necessary decisions and move on. Sure, they learn from their mistakes, but they don’t dwell on them. This is my favorite trait because it’s usually the most important one. Nearly every great owner-advisor’s greatest strength is coming up with big ideas to improve the business and client service. Unlike the vast majority of owner-advisors, they also know that there is a right time for every idea to be implemented, and most of the time, it’s not “Right Now!” Even though they want it done immediately, they know that every major change requires preparation (including employee buy-in) and careful implementation. Great owners take the time to ensure each idea is done right to get the right result. They also don’t say, “Our firm is further along,” or “We are bigger, more advanced.” I have prospective clients tell me this all the time, but I find that all my great firm owners would never say this. It is the biggest red flag I have in prospective meetings that makes me want to avoid working with that client. Great owners actually believe they are simply average, and it’s that mental attitude that drives them to work hard, to be better, to learn more—and eventually makes them the best. Successful firm owners try the best solutions they can think of, but after a reasonable amount of time, if they find that things aren’t working out, they either make modifications or pull the plug and try something else. To help firm owners take this view, we approach all our new initiatives with a plan that clearly includes the possibility that it won’t work. Make an honest assessment of the results. If you use metrics like the above, this is easier. In areas where you can’t, though, it’s vitally important to accurately determine how well you and your team did with each new project and make a decision about what needs to be done next. If an initiative didn’t work, carefully evaluate why it didn’t. This is really the key to successfully moving forward a firm or a career. We all learn more from failure than success—but only if we take a hard look at what went wrong. That means avoiding knee-jerk finger pointing, making excuses or rationalizing results. Decide to fix it or to try something else. If you’ve executed the first three steps well, this decision should be pretty obvious. Still, it’s hard for many people to admit failure, so try to leave your ego out of it and honestly determine whether a given idea is really worth spending more time or money on. With the baby boom generation of advisors reaching retirement age, one of the biggest problems that many owner-advisors face today is that they don’t have anyone who they believe can successfully succeed them. Consequently, they are often reluctant to start transferring ownership in their firms and creating profit-sharing programs that will fund the transition to a successor. In our work, we’ve found that one of the best ways to motivate owner-advisors to consider a succession plan is for his or her junior advisors to demonstrate their ability to approach the challenges of their jobs—and of the firm in general—as an owner would. When junior advisors consistently exhibit this kind of thinking, in many cases, they’re pleasantly surprised at how differently their firm owner views them.